​Skaters from Madison Roller Derby use their sport as a unique way to teach physics! Capture students’ interest and see the laws of physics demonstrated in an exciting new way! What is this program? What will my students gain? How are these concepts taught? Why is this worthwhile for my students? 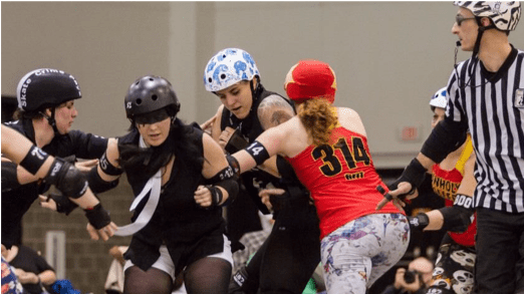 What is roller derby, and what is Madison Roller Derby? And, most importantly, what’s the next step to bring this to my students? ​We lead workshops on the physics of roller derby for students ranging from elementary school through college. We will work with group sizes anywhere from small individual classes to large assemblies of multiple grade levels. After our visit, we also have a series of worksheets and activities that can be used in the classroom to continue to build on the lessons learned. what concepts will my students learn? We have given workshops including all of the following topics, and can work with you if you have additional ideas you’d like to see. ​We have general workshops that cover all topics (in varying degrees of depth, depending on the age and experience of the audience), and can also create custom programs that focus just on one or two specific topics in more detail. You’ll see everything from the basic mechanics of how to skate, to a real, hard-hitting demonstration a roller derby jam. Check out the following examples! We can come to you! In order to fully demonstrate roller derby, we would need enough space for at least ten of us to skate—a gymnasium or cafeteria, for example. If this isn’t possible, we can also have fewer skaters do in-the-classroom demonstrations in a smaller amount of space. If instead you’d like to make this a field trip, and get your students on skates themselves, trips to Fast Forward Skate Center in Madison are a possibility. (Note that the students would be skating but not hitting each other or playing derby! There is still a lot they can learn about the physics of roller derby without risking themselves.) Note that Fast Forward charges a fee for renting the space, which varies depending on the length of time and other factors. Reach more students! Not only will our presentation increase understanding and excitement in students who are already interested in physics, but it can get the attention of students who may not have traditionally held an interest in the field. Sports are often used as ways to connect students to real-world physics applications. Books like The Physics of Football and television clips like ESPN’s Sports Science are two popular examples. However, the field of physics is heavily male dominated. Less than 20% of undergraduate physics majors are female nationwide. Studies show that there are multiple factors that discourage female students, and therefore multiple approaches to increasing their participation. In particular, some studies have shown that the context of physics problems is often written in such a way that it is unfamiliar to more female students than male students; furthermore, this lack of familiarity with context can have an effect on female students’ mastery of the material. Additionally, a lack of visible females in the field—a lack of female role models—can be detrimental to girls’ abilities to imagine themselves in the field, and therefore decide to pursue a career in it. ​Outreach, presentations, and classroom activities about the physics of roller derby would all help to counteract these issues. 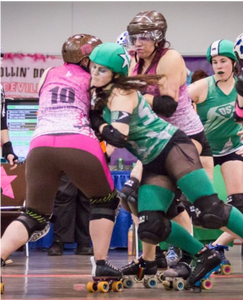 There are very few sports that are dominated by women; however, roller derby, a full contact sport that incorporates quad roller skates, has quickly become a sensation for fans and participants alike around the world. To many people, it’s clear that this sport takes a lot of strength, athleticism, and tenacity to play. 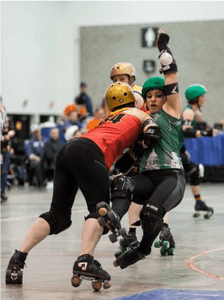 ​Using the physics of roller derby as a teaching tool has the benefits of the obvious sports-physics applications, while in addition providing an example that will not penalize students for a lack of knowledge. Most students will not know the rules of roller derby in advance, and those that do are equally likely to be male or female (roller derby fans are about 50/50 male/female). It would provide an example that would organically involve women, without excluding male students from topics they are less likely to be familiar with. so what exactly is roller derby? 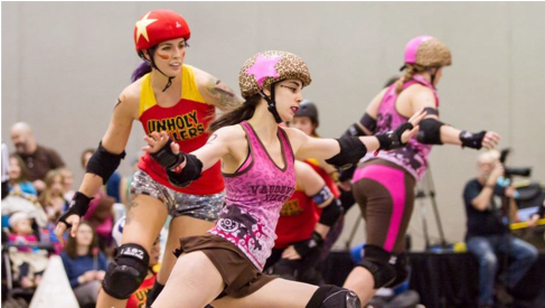 In its modern form, roller derby is played by two teams in two thirty-minute periods. Each period consists of multiple jams. Each jam is an opportunity for both teams to score points. Each jam lasts two minutes unless the lead jammer calls it off sooner. On the track each jam are one jammer and four blockers from each team (including one special blocker called the pivot). The jammers wear stars on their helmet to help distinguish them. They start behind the pack of blockers, and must get past the opposing team’s blockers in order to score points. They attempt to pass their opponents as many times as possible by sprinting around the track and lapping the pack. The blockers focus on stopping the opposing jammer from passing them, and assisting their jammer in passing the other team’s blockers. The pivot, who wears a stripe on their helmet, is a special blocker who can be passed the jammer’s star and earn points for their team. It is legal for skaters to block their opponents with their hips, rear, and shoulders. It is not legal to block to the back, to elbow, or to trip another skater. Players committing penalties are sent to the penalty box for thirty seconds, while their team plays short. what is madison roller derby? Madison Roller Derby first laced up its skates for the public in late 2004 and began its first full season in 2005. It was one of the original members of the Women’s Flat Track Derby Association. Since then, the dynamic skaters and dedicated volunteers have been providing a sport that not only features pure athleticism but a punch of serious fun for its many fans. MRD is a grassroots effort run by an all-volunteer group of skaters and non-skaters. Our league is made up of several teams. Our four home teams are the Quad Squad, the Reservoir Dolls, the Unholy Rollers, and the Vaudeville Vixens. These teams compete against each other at bouts at the Alliant Energy Center each season, competing for Leggy, our championship trophy. We also have two travel teams: Team Unicorn and the Dairyland Dolls. 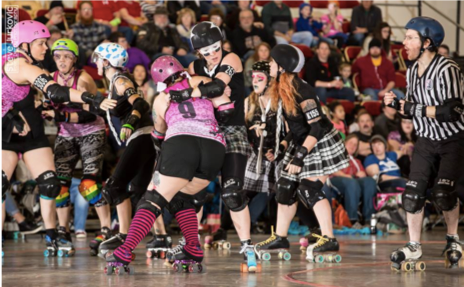 The Dairyland Dolls are highly ranked internationally, and have gone to the WFTDA international playoffs every year since its inception in 2006. We also have a recreational team, the Wreckers, where anyone can learn to skate and play derby. The Wreckers have two teams, the Black and Bluebirds and the Rumblebees, who often play each other in exhibition bouts in addition to playing other area teams. i want to bring this to my students! Now what? If you already know someone who is part of our league, you are welcome to talk to them about this and have them get ahold of us! ​​We lead workshops on the physics of roller derby for students ranging from elementary school through college. We will work with group sizes anywhere from small individual classes to large assemblies of multiple grade levels.